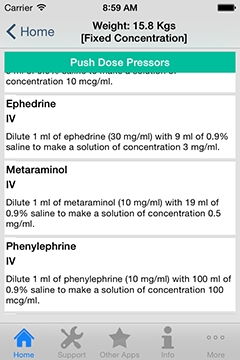 This application provides the healthcare professional with a method of titrating inotropes and vasopressors in a controlled manor without need for an infusion. 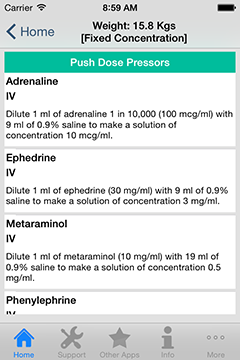 ‘Push Dose Pressors’ allows critically ill adults and children to receive quicker access to lifesaving vasoactive drugs. 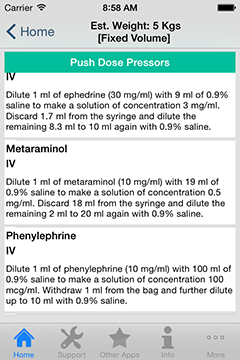 Designed to provide stability while a standard infusion is prepared or when haemodynamic compromise is expected to be short-lived e.g.induction of anaesthesia. 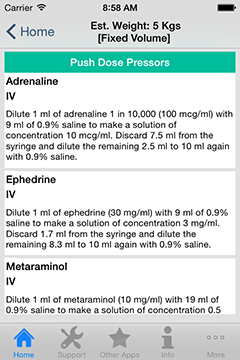 Doses and administration instructions provided for both adults and children. The ability to provide an ‘estimated weight’ for children using the latest versions of the Advance Paediatric Life Support(APLS) formulae. The flexibility of preparing medications for children using either a ‘Fixed Volume’ or ‘Fixed Concentration’ method. ‘Fixed Volume’ means the concentration you make up each time will vary depending on the weight of the child, however you always administer the same volume. 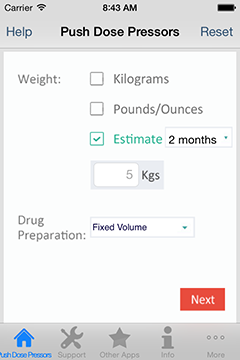 ‘Fixed Concentration’ means the drugs are prepared in the same standard concentrations each time, however the volume administered each time will vary depending on the child’s weight. This application is a must for any healthcare professional who as some stage may find themselves looking after an acutely unwell patient.